This is simply required reading. Coates’s latest, about growing up black in America, is written as a letter to his son. His writing, as always, is completely absorbing and powerful. There are enough articles floating around the internet about why you should read this. (And some terrible articles from raging racists, of course, and their existence alone is a reason you should read the book.) No matter who you are, read this book. And then have your family and friends read this book. I had hoped to love this book and alas, did not. It’s well done and captures the lives and trauma of a town plagued by tragedy after tragedy. There was plenty I did enjoy about it. However, I didn’t really connect with any of the characters. I also think 1950s suburban America is just not my cup of tea. This was a re-read for me before I saw the movie. I first read it right after it came out when I was 18. I think the story overall was more interesting at 18, but the message is something that impacted me then and stayed with me. “What a treacherous thing to believe that a person is more than a person” was stuck in the back of mind and served as a reminder throughout college and into adulthood. Seven years later and this book still got to me. I’ve been making an effort to read more comics and graphic novels. I graduated university with a degree in graphic design and clearly I love words so the combination of graphics and writing is something I do appreciate. Yet somehow they can be harder for me to get into. Probably just takes time to really enjoy. Anyway, in anticipation of Netflix’s A.K.A. Jessica Jones I decided to to pick up the original comics. I liked this second volume better than the first. And I love Jessica Jones as an ex-superhero character. I’m not sure the male writers of this completely did her justice but still found myself into the story. Hoping the Netflix series is even better. If you would like something gritty and heart-wrenching, well here you go. This book is worth the hype I saw all over my Twitter feed. The book follows Aaron Soto after his father’s suicide while he tries to come to grips with both what his father has done and thoughts about his own sexuality. Then there’s the Leteo Institute which has a memory-alteration procedure which looms over the whole story. The cast of characters in this is fantastic and it somehow covers so many different topics in little ways. I put this off for too long. 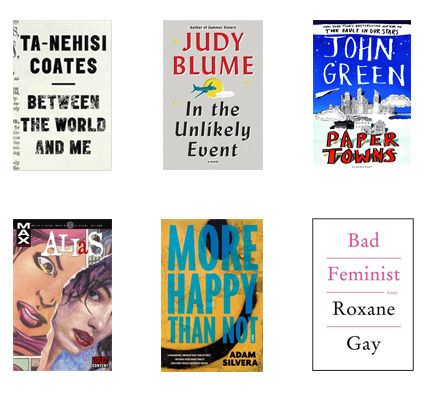 Because it’s the 21st century, I’ve followed Roxane Gay on Twitter for a while and she’s pretty kickass. This collection of essays is also pretty wonderful. The book isn’t strictly about Feminism. It’s more about Gay and her experiences as well as pop culture. While some of the pop culture references were lost on me, I still liked these essays. Gay has important things to say whether or not they are “new” things (as some reviewers find this not revolutionary enough). You have to repeat some things before people get them. When it comes down to it, I just like Roxane Gay. She is personable and funny and can also talk about big topics in way that is easily understood. With any collection of essays, I enjoyed some essays more than others. But overall felt they were well-written and worth the read.